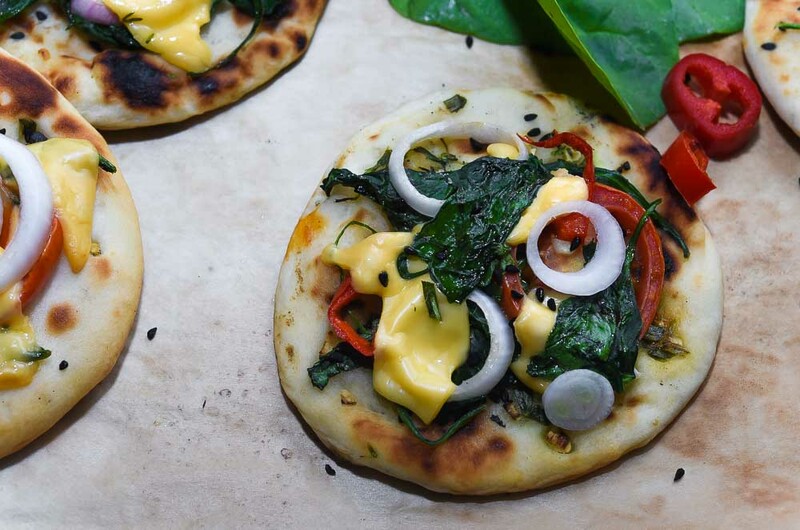 Naanza is nothing but, Indian naan fancied into a pizza. A combined venture of naan with pizza with many flavour algorithms. To be honest, it’s a fattening damn delicious carb packed treat. I have my own version of Naanza, which is a little less cheesy and is topped with vegetables and herbs. Its quite an engaging comfort food, which does not require a lavish surrounding of any dips and sauces. Homemade is definitely a better choice. It’s a simple, yet a complicated dish to make at home. Complicated, only if you are making the Naan at home from scratch. And if you choose to get lazy and use a naan bought from your favourite restaurant, you will save a lot of time and effort. For me, I love making naan/kulcha at home. 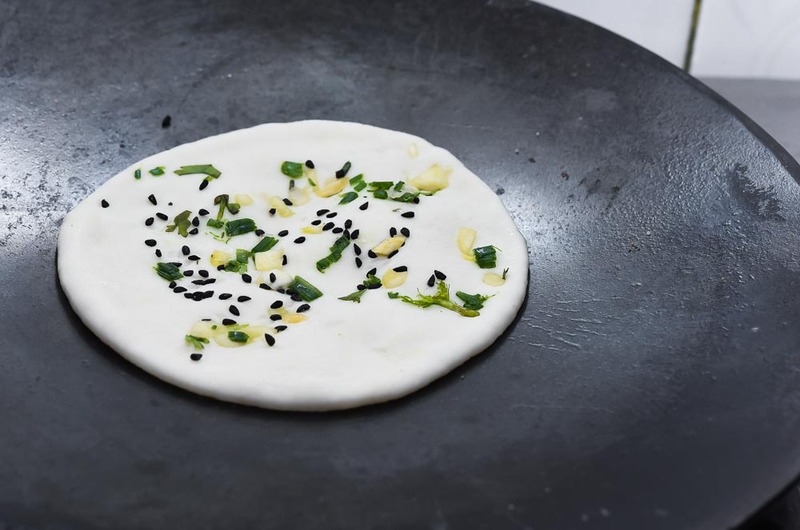 It is my mom’s recipe and the style of making naan on an iron griddle (tawa) at home without a tandoor. You may call me an enthusiastic kitchen bird, but I love doing things from scratch. 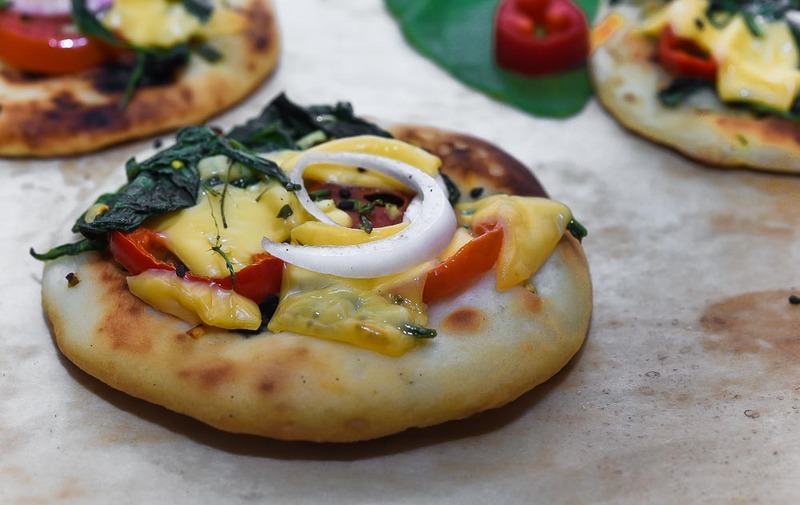 Here is a quick description to the homemade tawa naan and how to turn the naan into a pizza. 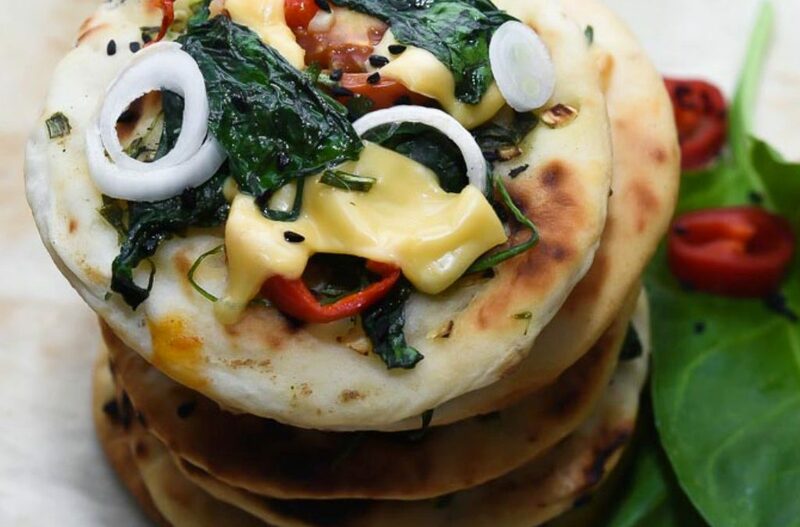 I choose to make mini naans, you can go ahead with bigger size using the same recipe. Naan and pizza are quite similar. There is dough which is rolled out and cooked. 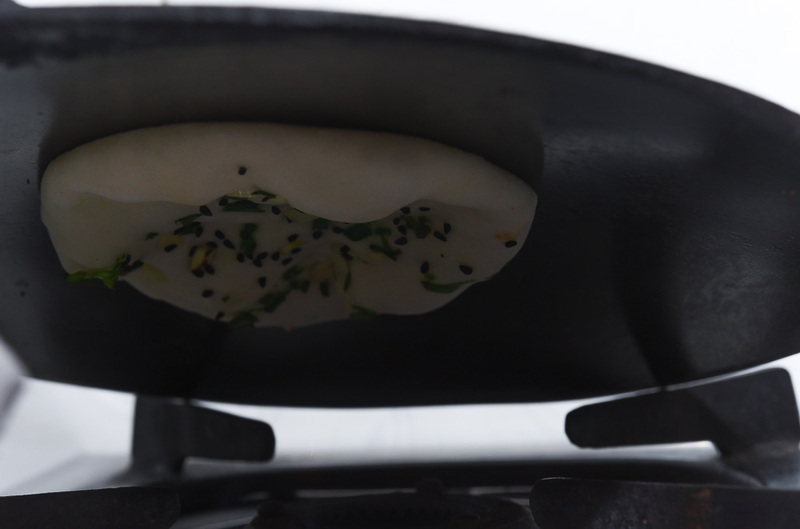 For naan, it is cooked in a tandoor. A tandoor is like an upturned vessel of clay or metal which is heated using charcoal from the bottom. Pieces of the Naan dough are rolled out and slapped to the walls of this heated vessel. They become crunchy with a hint of charcoal taste at the bottom and on the top, whereas the inside remains soft. And pizza is cooked in a stone oven, slathered with cheese and sauce. Once you have your dough ready (as per the recipe mentioned below) and it is rested for an hour or above. Take one part of the dough and roll it into a ball. 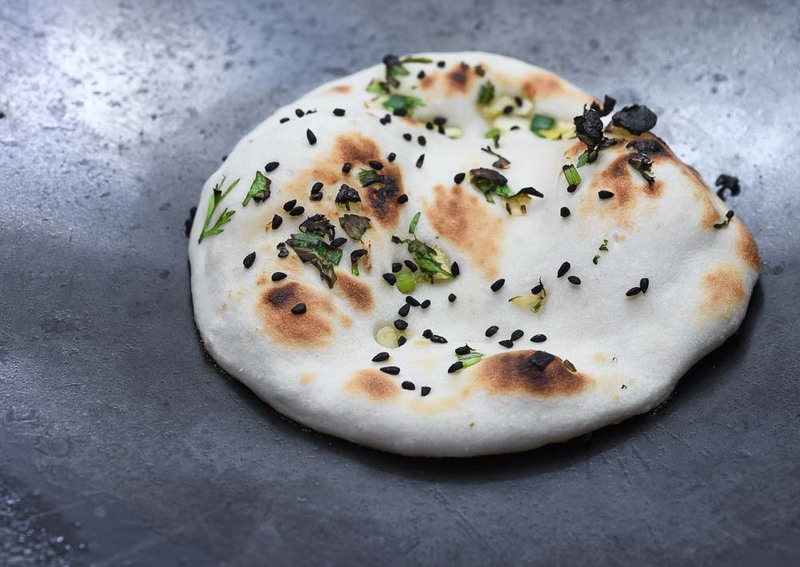 Dust the rolling pin and the kitchen counter with a tiny bit of dry flour and roll out the dough ball into a medium thick naan (size as per your choice). just make sure it should not be larger than the tawa. 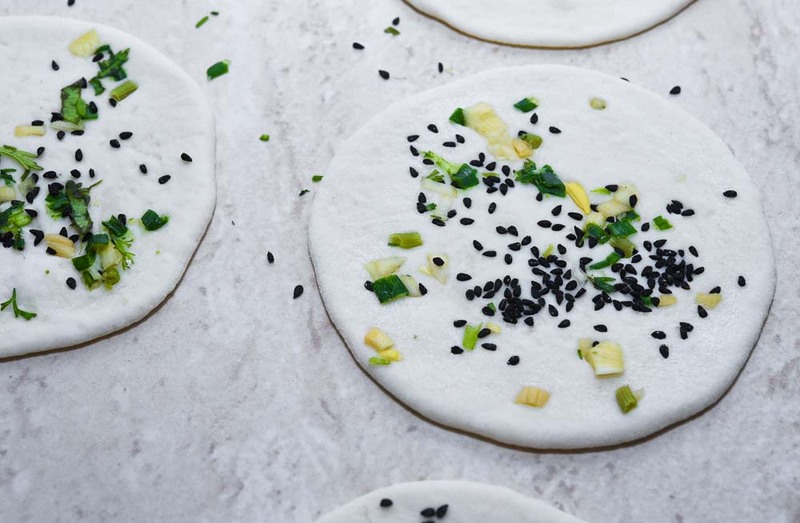 Sprinkle the mix of (kalonji (nigella seeds), minced garlic, chopped green parts of spring onion and some chopped fresh coriander leaves) on the rolled out naan and gently run the rolling pin over the naan once again, so this sticks to the dough. Heat the tawa on medium heat and make sure it is really hot before you put the naan on it. Apply water on one side of the naan uniformly so that it gets stuck on to the tawa. Flip the wet side down on the hot tawa and press it lightly. Flip the tawa upside down it will not fall down. Once the naan starts bubbling as shown in the picture here. And you see the golden brown spots on naan. Remove the naan from tawa and apply some butter. You can serve the Nanna right away when it’s hot. And believe me it’s very very delicious at this stage. For the topping – go with what you like. I have taken some balanced spinach, chillies, tomatoes and onion with some homemade pizza sauce. I was a miser for cheese usage. You can take your call and have plenty of cheese because more cheese = more taste. You can also try different toppings like – Tandori panner or roasted bell pepper or pesto. 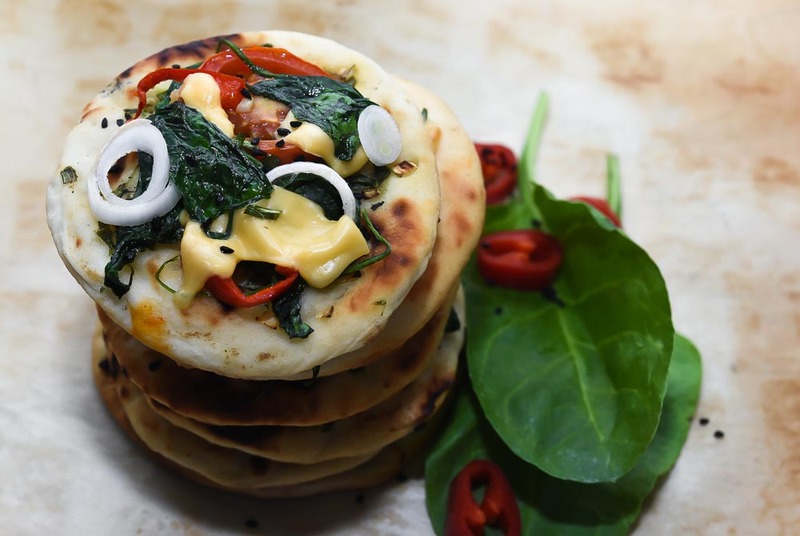 Once your naan is ready and you assemble the topping on the top, place it in the oven near the top element and cook till the cheese is melted. 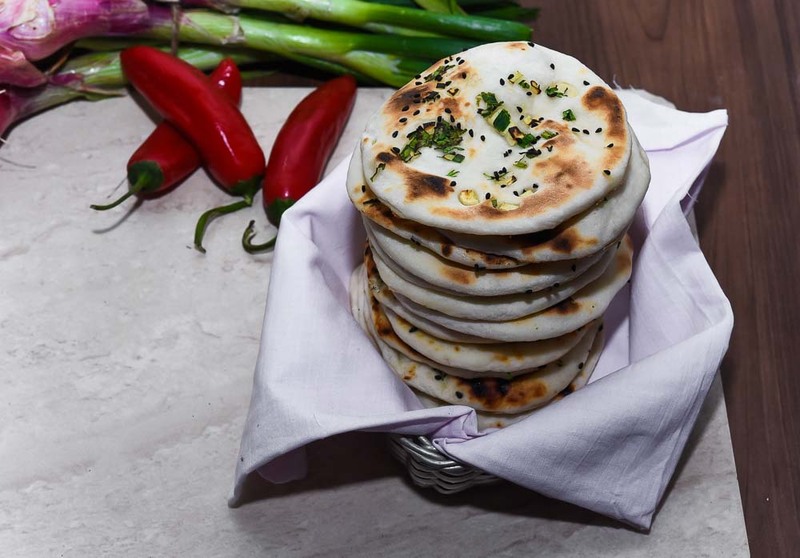 Overcooking the naan will make it hard, so avoid going overboard. Combine the flour, salt sugar, active dry yeast and use curd to knead into a soft dough. You should knead for about 12- 15 minutes. to turn the dough into a smooth soft, elastic, pliable dough. Cover the dough with a lid or wet muslin cloth and allow it to prove at a warm place in your kitchen till it increases in volume slightly (approx. 30 minutes). Deflate the dough and remove the excess air. Prepare the naan using the same method mentioned above. Once the naans are ready, apply some pizza sauce and top with the vegetables of your choice. Sprinkle some cheese and bake at 200*c for 3 minutes, till the cheese melts. Enjoy when hot.